That is right… 27.9 million small businesses in the US who are trying to figure out how to get more leads and more sales for their business. And their old fashioned marketing tactics are no longer “working” like they used to… radio, tv, newspaper, and the billboard industry are all seeing declines in business. Do you know what industry is on a rapid incline? Digital marketing and online advertising. In fact, the digital marketing industry is increasing so rapidly, that there is a high demand for digital marketing consultants to help these 27.9 million small business owners to navigate topics such as: landing pages, pixels, sales funnels and email marketing. With an increase of small business owners starting up new Facebook Pages, putting up new Facebook Ads and attempting to capture leads; the competition for the market share is growing more competitive. Therefore, the advertising and landing pages that worked last month, might not be working this month. In the past, you shot 1 video, recorded 1 radio commercial, put up 1 billboard, and then as a business owner, your only responsibility is to pay the bill every month to keep the advertising up. Today, these same business owners are finding it more difficult to advertise online because it is so simple. Those of us who market online can have new promotions online in minutes, not months. In order to stay on top, the small business owner has two choices: A) Learn how to become an expert digital marketer or B) hire a consultant or funnel builder to create leads and sales. Ok, so the demand is there… now what? Here is the secret sauce for Funnel Builders & Funnel Closers: We can template the sign up pages and the processes then go out and resell the same marketing package over and over again. How do YOU capitalize on this massive opportunity? That is it! You don’t need to learn how to code, or learn graphics. Simply join the program and hook up with a funnel builder who can be your fulfillment team and that is it! 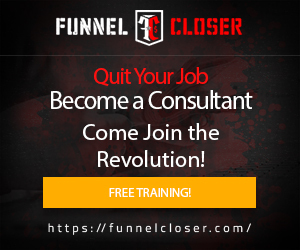 There are over 300 funnel builders ready to get started working with you!